Take all the delicious warm, nutty flavor that you love from classic pecan pie and add it into a perfect holiday breakfast casserole! This Pecan Pie French Toast bake will make a tasty brunch recipe for Thanksgiving, Christmas, or New Year’s Day!! 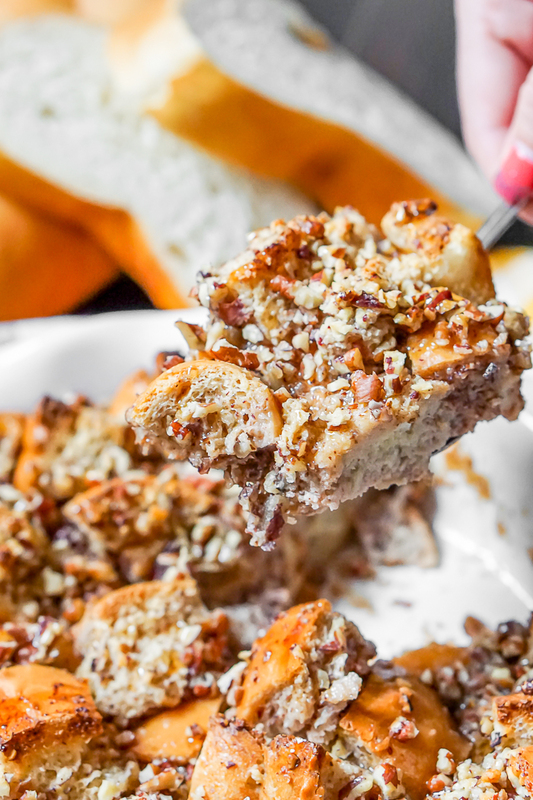 Pecan Pie French Toast Bake is warm, nutty, and holiday perfection! Breakfast casseroles are a favorite around here! Firstly because they are usually easy to throw together with ingredients being mixed and tossed effortlessly into a casserole dish for the oven. This makes them perfect for lazy Sundays mornings at home as well as a big holiday brunch like Christmas! Second because they can be prepped ahead of time, making it even more appealing for a holiday brunch. No one really wants to be cooking Christmas morning or after staying up late for New Year’s Eve, so this casserole dish can be prepped ahead of time and then placed in the oven when ready for baking. Lastly, no matter what day of the year, a warm french toast casserole certainly tastes better than a bowl of cereal. Even more so on cold winter days! So needless to say, this Pecan Pie French Toast Bake is a big hit in my books! Sweet, dessert inspired breakfast recipes aren’t new to the blog. In fact, my cinnamon roll casseroles and muffins are some of my most popular. For this recipe though, I was inspired by the classic Pecan Pie! The filling used for this bake is very similar to the filling for pie. One of the key ingredients you’ll find missing from the filling itself is eggs, but that is because you find eggs elsewhere in the recipe. Trust me, this will make a holiday brunch your family and guests are going to swoon over! I mean, who can say no to a warm, dessert inspired breakfast on a cold morning? If you love pecan pie, you might also be interested in my Pecan Pie Cookie Cups which are sugar cookie cups filled with a similar pecan pie filling that I use for this french toast bake AND my Mini Pecan Pie Cheesecakes which are addicting! 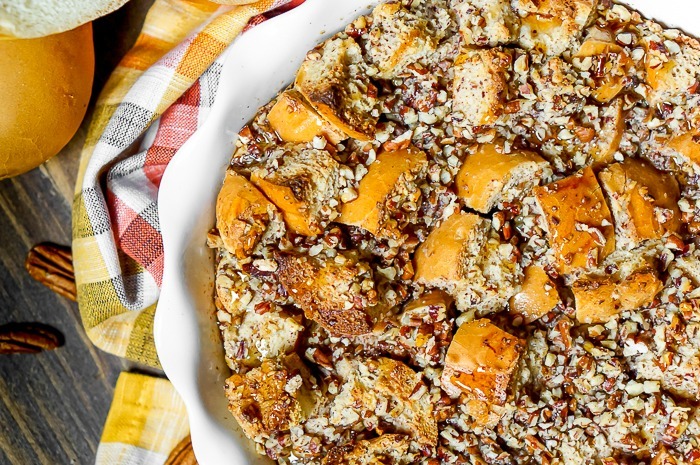 First, you can’t have french toast bake without french bread! At least not in my kitchen! You will want to prep all of your french bread for the base by cutting into 1 inch pieces. Second, you will want to mix up your pecan pie filling that will go on top of your french toast bake. It’s an easy process – simply add everything to a bowl and mix thoroughly! CORN SYRUP TIP: When working with corn syrup, use cooking spray to coat your measuring cup first before measuring the syrup. This will help the corn syrup come out of the cup easily and make clean up a breeze! Third, you will mix up the egg mixture in a different bowl with the half and half, vanilla, cinnamon and pecans. Fourth, pour the egg mixture over the bread and then the pecan pie filling. Lastly, all you need to do its bake for 25-30 minutes at 375 degrees. Casserole Dish —> I am loving this baking dish right now, especially the cover, but you can always use basic glass casserole dishes, too! This nut grinder is one of my most used kitchen gadgets, especially during baking season. 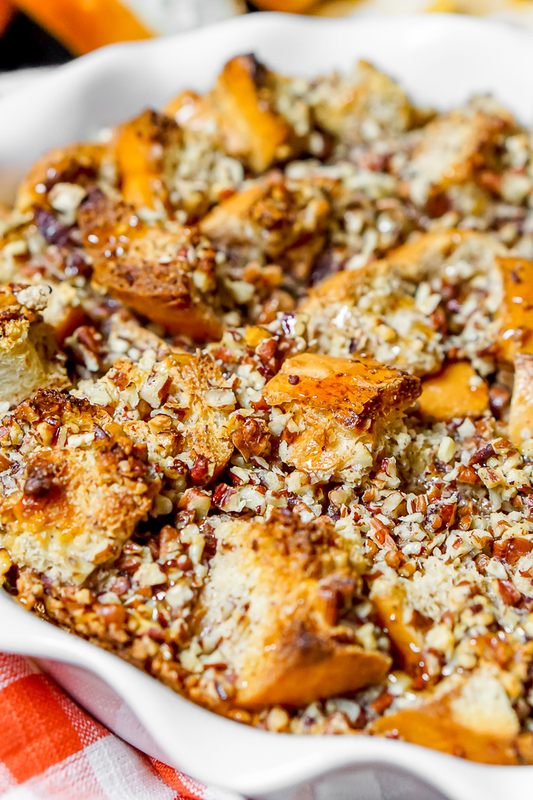 TIME TO WHIP UP A BATCH OF PECAN PIE FRENCH TOAST BAKE YOUR GUESTS ARE GOING TO LOVE! Take all the delicious warm, nutty flavor that you love from classic pecan pie and add it into a perfect holiday breakfast casserole! This Pecan Pie French Toast bake will make a tasty brunch recipe for Thanksgiving, Christmas, or New Year's Day!! Mix together the Pecan Pie filling well. In a different mixing bowl, combine the half and half, eggs, vanilla, cinnamon and pecans. Add the chopped bread to a casserole or pie dish. Pour over the egg mixture first, then add the pecan pie filling mixture. Bake for 25-30 minutes, until golden brown and cooked in the middle. 12 Days of Christmas – Fun Couple or Family Advent!